Published: Dec. 30, 2018 at 09:28 p.m.
Tennessee Titans cornerback Adoree' Jackson's muffed punt leads to an Indianapolis Colts recovery. 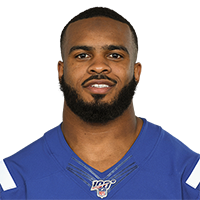 Published: Aug. 26, 2017 at 11:29 p.m.
Indianapolis Colts cornerback Chris Milton picks off Pittsburgh Steelers quarterback Landry Jones in the end zone. Published: Sept. 1, 2016 at 10:24 p.m.
Indianapolis Colts cornerback Chris Milton intercepts Cincinnati Bengals quarterback Keith Wenning to seal the win.